Wireless Festival recently announced the 2018 line-up for their three-day event which takes place on the first weekend of July at Finsbury Park in North London. The annual festival has been going strong for 13 years and it is one of the biggest urban music city festivals in the country, attracting performers and fans from all over the world. Time and time again the popular festival gets slammed for frustrating the public with a line-up disproportionately made up of men. The line-up simply does not reflect how far women have come. 100 years ago, many women in the UK lost their lives fighting for gender equality and the right to vote. It was and still is such a revolutionary time to reflect on. The Representation of the People Act was put into effect in February 1918 meaning that 8 million women were finally granted equal voting rights. But, I refuse to sugar coat this Act because not all British women were fortunate enough to have the luxury to vote until 1928, and I use the term “luxury” because, although voting rights should be a necessity for all, it wasn’t seen that way in the unfair “elite democracy” of the 1920s. As a woman living in 1918, you would have to be over the age of 30 and either own land yourself or be married to a man with property to be granted voting rights. So, for working class poor young women, nothing really changed at all. It wasn’t until the Equal Franchise Act was adopted in 1928 which gave a further seven million women the right to vote. Over the last century, you would expect gender equality and women’s representation in Britain to continue to improve – thankfully there were some massive improvements. For example, in 1965 Barbara Castle was appointed Minister of Transport, becoming the first woman minister of state. In 1968, women protesters from the sewing machinists strike at the Ford car factory in Dagenham directly led to the passing of the Equal Pay Act which came about over the gender pay gap between men and women at Ford, and in 1985 the first black lesbian conference was held in Britain. Those are just a small handful of the many revolutionary movements towards better gender equality in Britain. However, women’s representation at national festivals has improved so little that it’s actually embarrassing. English singer and presenter, Lily Allen, recently criticised this year’s line-up for only including three women: Cardi B, Mabel and Lisa Mercedez, out of over 40 acts. This is even worse than last year’s line-up which only included five women artists. Male-dominated festival line-ups is not an issue exclusive to Wireless – last year The Independent reported that “Reading and Leeds festival had a line-up of 57 men and just one woman”. These statistics are ironic considering it’s been a century since women could vote in parliamentary elections. 100 years later, we are still dealing with gender inequality issues and the case for women’s representation at festivals remains backwards. In 2014 L.A Times interviewed a festival promoter to see why there is a lack of women artists at festivals. His response was “women don’t want to see other women perform, they tend to want to see men perform”. In order to have a future of inclusive festivals, organisers and promoters need to stop making dangerous sweeping assumptions about what women actually want. There should also be a push for more women festival organisers to be involved in the decision making process of line-ups. 2) Think outside the box British singer, songwriter, and gal-dem covergirl Ray BLK (we love you) was asked to perform at this year’s Wireless Festival but told Twitter that she turned down the offer after several people wondered why she wasn’t on the 2018 line-up. But, Ray BLK being busy this year does not justify the poor lack of women on the line-up. The UK is far from short of talented women so festival organisers need to think outside of the box and make more of an effort to seek women performers. 3) Positive discrimination is always an option Positive discrimination is the practice of favouring individuals belonging to groups which suffer discrimination. In this instance, it is women artists that are discriminated against through a lack of representation year after year at national festivals up and down the country. In order to stop this unhealthy pattern for good, perhaps festival organisers need to adopt forms of positive discrimination. For example, maybe there should have to be at least 20% women on a line-up. I appreciate that it’s not always realistic to have 50% men and 50% women each year because it just might be a coincidence that more male artists are popular one year and vice versa. However, having 20% minimum women artists ensures that the ratio will not be as terrible as it’s previously been. 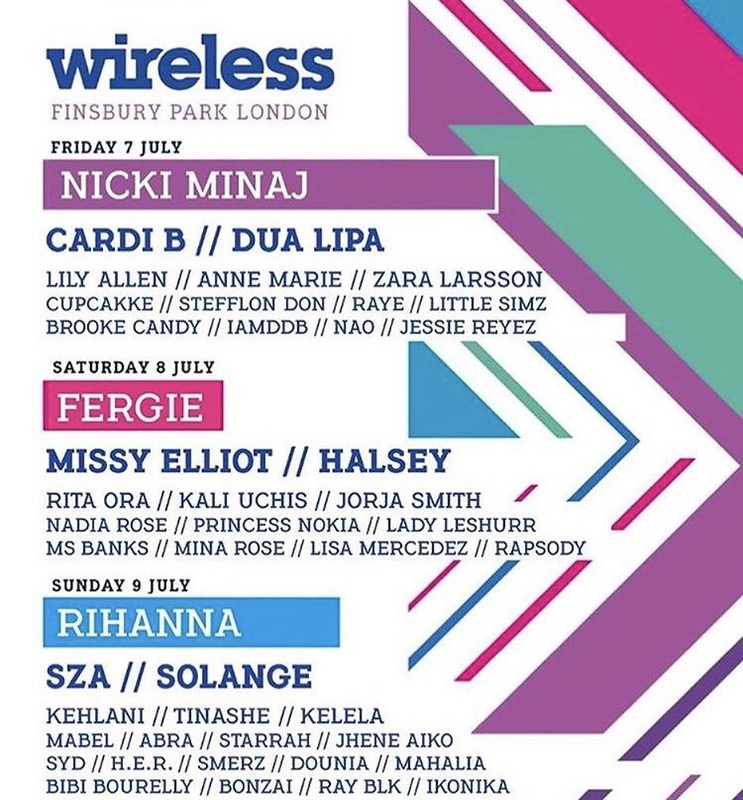 4) Let this picture inspire you Unfortunately, this is just a fake photo of a new and improved Wireless Festival line-up, but it just goes to show that it is realistically possible to have more women artists involved. I hope this photo encourages festival organisers to take the wool from their eyes and see that wholehearted women’s representation can be achieved, with ease.